Hapimag guests are very satisfied with the quality and services provided by the resorts, according to the latest HolidayCheck awards. Three Hapimag resorts even made it into the top 5 of their country in their respective categories. The resorts also achieved excellent recommendation rates. The Resort Managers of these three destinations accepted their awards in person in Berlin: Tina Gerlach for Ascona, Philippe Weibel for Albufeira and Sven Kornemann for Scerne di Pineto. 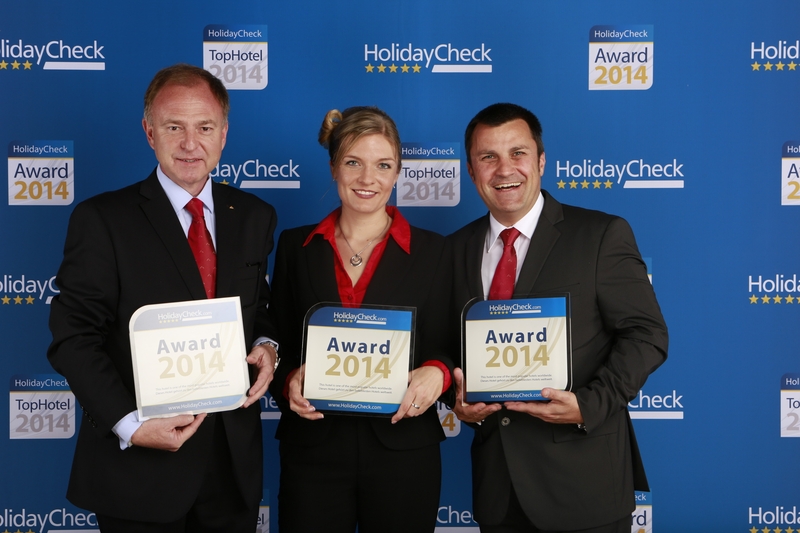 “These awards are a wonderful confirmation of our high quality standards. And at the same time, they will serve as motivation to continue doing our best for our guests,” said a delighted Marisabel Spitz, CEO of Hapimag. Antibes, Chamonix, Paris (all France), Damnoni (Greece), London (England), Cannero, Cefalù, Pentolina (all Italy), Amsterdam (Netherlands), Marbella and Paguera (Spain) and Prague (Czech Republic). In 2013, the average rating across all Hapimag resorts and residences was a very good 5.4 points out of a possible 6. The recommendation rate is an outstanding 98 percent.